I am back. It is so nice to have access to a computer and the internet. I can process images and share them again. This is my first image as it was always going to be the easiest to process. 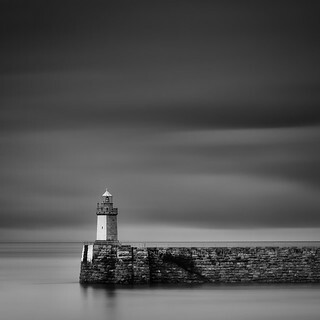 A classic long exposure lighthouse shot. I know I owe many contacts some views and comments on their images. It's been quite annoying actually as I can see so many great images on my phone, but it's hard to make a useful comment on a 4" image. I'll be catching up on the weekend. I was going to head off down to the south coast of Guernsey whilst I was there, but it struck me how much more impressive their harbour was than ours, here in Jersey. So I spent the whole morning just wandering around the harbour and then the heavens opened up and put an end to the day's photography. I only wish that I could have got lower down and not had the horizon visible above the breakwater.